This is a regional favorite that might not be appreciated by everyone. Add sugar and flour to beaten egg. Beat well. Add vanilla, butter, and milk. Mix well. 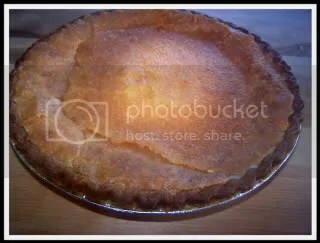 Pour into pie shell and bake at 400 degrees for 10 min. Reduce temperature to 350 degrees for 25 minutes or until pie is firm around edges. Transparent pie actually goes as far south as Flemingsburg – being from Paris, I can attest that it was a summer favorite dessert of my grandmother’s. I see your recipe differs slightly from hers, though. At least yours doesn’t include vinegar. Each to his (or her) own! As for the Clooneys, Rosemary was a lovely woman, very sweet. I hear Georgie was a brat as a child (being far behind him in age, I wouldn’t know personally).